Have you been craving a little bit more from your speaker set up? Does you audio equipment not deliver the full range of sound you want in your music? Are you trying to hear all the richness and color that bring your tunes to life? 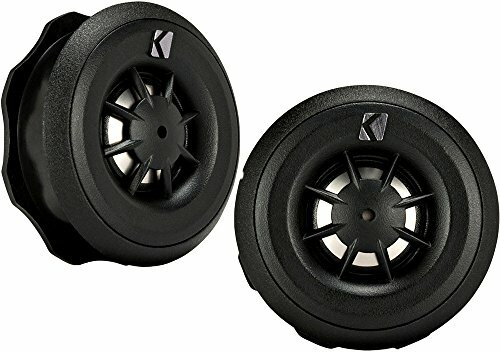 If you are feeling less than satisfied with your speaker situation, you should look into investing in some high quality tweeters to take your sound to the next level. Tweeters are smaller speakers that create the higher frequencies in music. That includes important things like vocals, guitars, horns, and any other higher note that helps transport you from your car to your own personal music video. Imagine you are listening to a Mariah Carey song with her world famous falsetto. If you do not have tweeters that can handle the high frequencies, then you will not be able to experience the magic in her voice. Clearly nobody wants that, so use this helpful guide to educate yourself on which tweeters are best for your situation. When deciding on the best tweeters for your particular set up, there are a few characteristics that you will want to take into account. These attributes can be the deciding factor on whether a tweeter is perfect and turns your car into a private concert hall, or if you end up with a lousy piece of junk that cannot even fit in your car. The characteristics that you want to pay attention to while deciding between tweeters are power handling, frequency, shape, materials, and positioning. Power handling in tweeters refers to how much energy the speakers can handle. This is represented in watts (W). The more power they use, the more volume you get. The kind of power handling you are interested in is referred to as RMS. The RMS value is how much power the tweeters can handle on average. A good RMS value for tweeters is usually at least 50 watts. Frequency refers to the vibrations of the sound waves that come from the tweeters. This is represented in hertz (Hz). Because tweeters are used to produce higher pitches and noises, it is important for that speaker to be able to reach those higher frequencies needed to make those sounds. A good frequency range for tweeters is about 2,000-20,000 Hz. The shape of the tweeter can make a huge difference in the sound it creates. There are four main shapes for tweeters: cone, semi-dome, dome, and inverted dome. Cone shaped is the most common, because it is the easiest and cheapest to produce. Because they are so cheap, they do no spread sound well or reproduce very accurate sounds. Semi-dome shaped is another low cost option where there is a small dome placed inside of the cone. Semi-dome tweeters are made of softer materials and have lower profile that makes them less likely to break or malfunction. Dome shaped tweeters spread the sound around much better, which also creates a bigger sweet spot for the best possible sound quality. Larger dome shaped tweeters disperse more sound, but they also need a lot more power to do so. Inverted dome shaped tweeters are exactly what they sound like – instead of the dome sticking out it is actually concave and goes into the speaker body. These tweeters are more efficient, have better sound radiation, and also are easier to control. The materials used to make up your tweeters will also impact the sound quality produced by them. The different materials are typically broken down into three groupings: synthetic films, textiles, and metals. Synthetic films include mylar, polyimide, and PET. These materials are light, require less power, and are inherently resistant to humidity. However, their lack of stiffness does tend to make the sound less accurate. Textiles include primarily silk and silk-blends. These kinds of tweeters sound warm, calming, and refined. They are great for creating lifelike sound in your music. They are often reinforced with synthetic materials to make them stiffer, so they can sound just as accurate at high volumes. If background noise is not an issue and the inside of your car is mostly hard plastic anyways, silk tweeters will give your music a more natural sound. Metals primarily refer to aluminum and titanium, though this group also covers all other metals and metal blends. Aluminum is the most popular metal because it is light, strong, and produces crisp, bright sounds that cut through background noise and booming bass. Titanium is also extremely light, and able to be extremely accurate without that harsh edge some people hear in aluminum. Positioning refers to the placement of the tweeters throughout your vehicle. The higher up you place your tweeters, the better they will be at dispersing sound in the entire vehicle. This will help create that surround sound effect you are looking for, instead of only hearing your music out of the speakers in your car door. 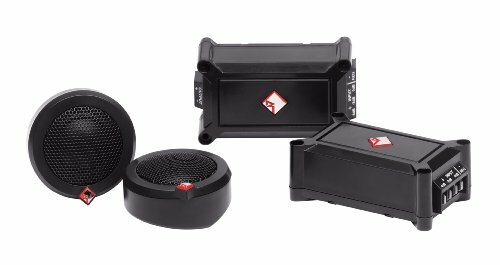 The JBL GTO19T Premium Component Tweeter is a great option for those trying to find tweeters that can sound great at high volumes. These tweeters are definitely the ones for those who like to roll down the windows and crank the volume as high as possible. 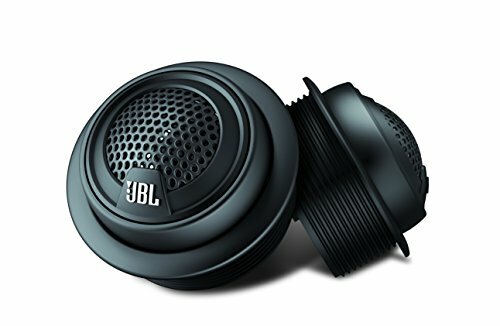 The JBL has great power handling, meaning it has no problem reaching those top level volumes. It also has a very low impedance rating, making it an extremely efficient choice when it comes to blasting tunes. The Power Acoustik NB-2 tweeter is an excellent choice for those who are looking for tweeters that can be played loudly regularly, without putting too much of a whole in their wallet. This inexpensive tweeter has very high power handling, especially for a tweeter this small. This makes it the kind of speaker that can be blared at high volume and the music will still sound good. The Power Acoustik does have some issues producing completely accurate sound, and does often deal with some slight buzzing and interference. This is mostly due to the lower quality materials of which it is made up of, which also lead into its issues with durability. 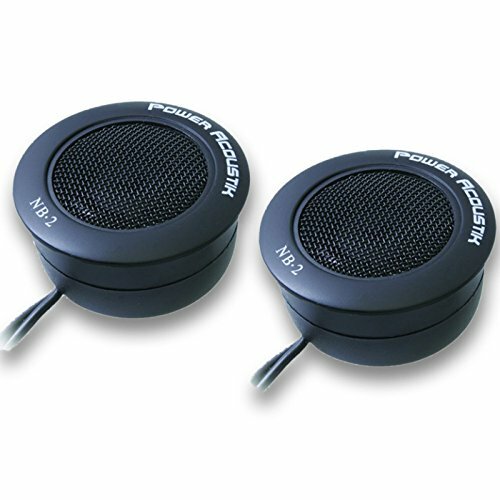 Overall, however, the Power Acoustik is great, cheap option for people to who like to play their music loud. The PRV Audio TX350Ti Super Tweeter definitely earned the name super. One of the best overall options out there when it comes to tweeters, the PRV is made of materials of the highest quality. It will last for a long time, and will stay just as effective throughout. This bad boy is designed to reach the highest frequencies, and has high sensitivity and power handling. 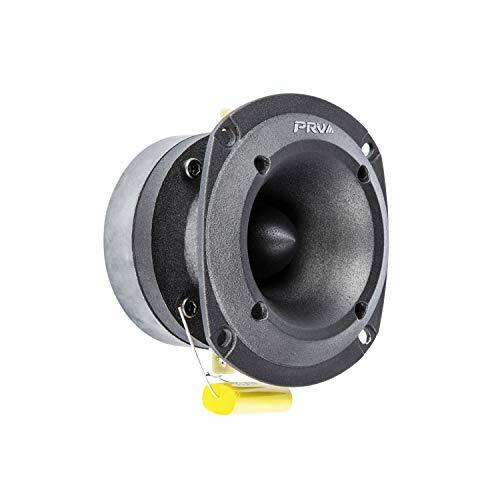 If you are looking for a top notch tweeter that can deliver whatever you need in terms of sound, look no further than the PRV. The QuestAudio Pro Series 3000W Titanium 4″ Bullet Car Pro Super Tweeter PT-01 is an excellent tweeter that produces some of the best quality sound available. It has an extremely high power handling rating, as well as high sensitivity, so it is able to produce crystal clear sound even at high volumes. Being made of aluminum helps improve the sound quality, and the advanced cooling system keeps it from smoking when the beats get too hot. The QuestAudio does have fairly high impedance, making it inefficient, especially in comparison to the other tweeters on this list. It is also one of the bigger and heavier options, allowing it to be loud but also preventing it from reaching some of the higher frequency pitches you might like. The Pioneer Pro Series TS-B400PRO Bullet Tweeter is one of the more expensive tweeters on this list, but it is worth it because of its great sound and high quality materials. Being made up of both aluminum and titanium makes this tweeter much sturdier and also helps produce great sound quality. Its high sensitivity and power handling mean it sounds great, even at absurdly high volumes. There are some who claim to hear a slight whistling noise in the background when they use these tweeters, but overall the quality of sound and materials makes this tweeter well worth the larger price tag. The Rockford Fosgate Punch P1T-S tweeter is more expensive than some of the other options on this list. However, with its one year worry-free warranty, you do not have to be afraid of not getting enough return on your investment. This tweeter is very small and light, helping it create brighter sounds, and its multiple mounting options mean the possibilities are endless when it comes to setting it up. Occasionally the sounds can sometimes be a little too high, but the overall quality of the Rockford Fosgate makes that hefty price a little more reasonable. 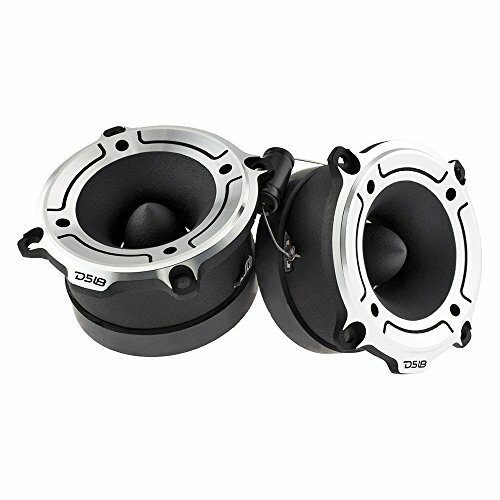 The Kicker 43CST204 Cs-Series tweeter is another expensive option, but the quality materials and sound justify the cost. The titanium frame helps produce brighter sounds, and its good power handling produces music of the clearest quality. It is durable, and will hold up to the test of time in your vehicle. Along with being expensive, the Kicker is also one of the harder tweeters to install, even though it is small and very light. And despite its impressive power handling, it is not as loud as some other tweeters with similar specs. The DS18 Super Bullet Tweeter produces great sound. It has great power handling and high sensitivity, meaning it sounds great at all volumes. The high quality materials help produce louder, fuller sounds and make it a reliable option that you likely will not need to replace any time soon. The DS18 does have a relatively low frequency range, so it might not be able to reach some of higher pitches at the tip top of the spectrum. This is at least partialy due to the fact that it is definitely on the heavier side compared to other tweeters on this list. Still, the DS18 produces some of the highest quality sound available from a tweeter. 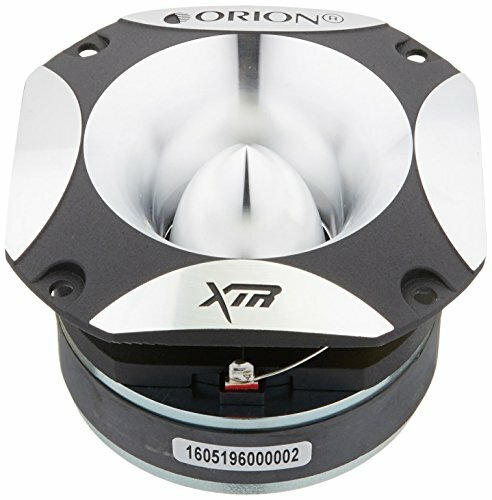 The Orion XTW950FD XTR Series Tweeter is a hulking behemoth when compared to most other tweeters. However, this bad boy is still able to reach most higher frequencies, allowing it to still produce those lighter, brighter notes. It also has excellent power handling that helps it reach those upper level volumes. Meanwhile, its high sensitivity ensures that the Orion still sounds great no matter volume you are playing it at. 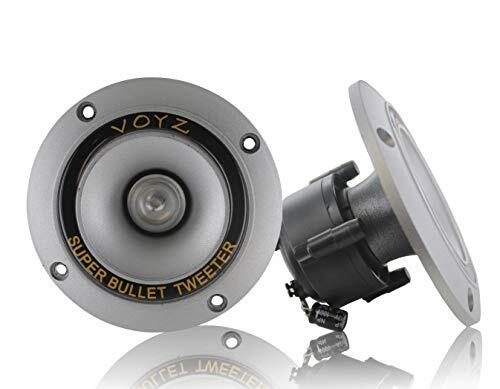 The VOYZ Super Piezo Tweeter is one of the cheapest options available, so if you are primarily focused on saving a couple bucks this is a great tweeter for you. Even at the low price point, this tweeter still has a high power level and frequency range. Therefore, it is still able to produce high quality sound for a low quality price. It also features a cool color changing light right in the middle of the speaker that can be hooked up to change according to your music, so you can have your own mini raves in your backseat. The VOYZ does have a fairly high impedance, making it a pretty inefficient option. Also, it is not very durable and will likely not hold up as well as most other tweeters. However, at this price with this good of sound, the VOYZ is a tweeter worth taking a chance on. Tweeters are a great addition to anyone’s vehicle. Who would not want better, more dynamic sound while cruising down the street? No surround sound audio system is complete without them. Tweeters are great at complimenting the music coming from your other speakers and subwoofers, providing the right amount of high pitched twinkle to create a deeply vivid and colorful soundscape. To make the most of your cars musical capabilities, get yourself some tweeters today. Just make sure you use this helpful guide to determine which tweeters are best for you.